Anti-fossil fuel activists have sucked tens of billions of dollars out of the U.S. economy and seriously crippled manufacturing jobs, according to a report Tuesday from the U.S. Chamber of Commerce. Activists have prevented at least $90 billion in domestic economic activity and eliminated roughly 730,000 job opportunities, the Chamber of Commerce Global Energy Institute (GEI) report notes. Federal and state governments have missed out on more than $20 billion in tax revenue. GEI used public sources for data on job creation, tax revenues to determine costs and the size of job loss. The total economic impact includes ancillary effects throughout the economy from project-related spending. The method GEI used is frequently employed to show the direct, indirect, and induced impacts of new economic activity on the economy overall. The report calculated the economic costs of New York’s statewide fracking ban, as well as the effect the anti-oil movement has played on 15 energy projects, including a stretch of the Keystone XL Pipeline in Nebraska and Montana. A federal judge blocked the pipeline in November following several months of lawsuits and counter-lawsuits. 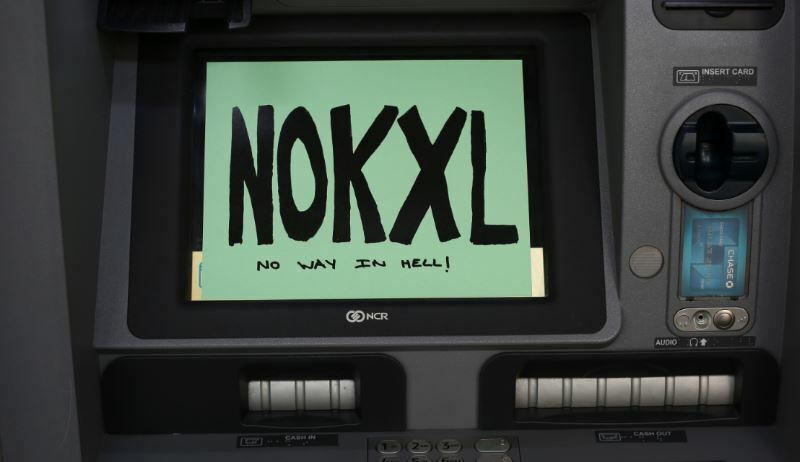 A sign opposing the Keystone XL Pipeline sits atop the screen of Chase Bank ATM U.S. May 8, 2017. GEI found the Keystone XL Pipeline suffered as much as $12.4 billion in lost gross domestic product since August 2018. Meanwhile, New York’s fracking ban has cost nearly 191,000 jobs, not to mention prompted the state and outer-lying areas to import natural gas from Russia in 2017. “Unfortunately, a small but vocal group of activists is waging fights against these projects around the nation. Our new report demonstrates just how damaging that is to families, consumers, and American workers,” Karen Harbert, CEO of GEI, wrote in a press statement attached to the report. Terry O’Sullivan, general president of the Laborers’ International Union of North America (LIUNA), mirrored much of Harbert’s concerns during a phone conference Tuesday addressing the report. He especially took issue with a new strain of environmentalism gaining prominence within the Democratic Party. Opposition to natural gas and oil wreaked havoc for northeastern states in 2017. Officials in Massachusetts and neighboring New Hampshire blocked financing in 2016 for the $3 billion Access Northeast Pipeline, which would have helped the state weather an energy crunch this winter. The state’s decision to rely principally on green energy hiked gas prices and forced it turn to Russian oil imports.